The Netherlands is one of the best cycling destinations in the world. The city has numerous dedicated infrastructure for cycling. Cyclists can cycle in almost every street as most streets have bike paths. There are numerous biking trails in the country. Due to the popularity of cycling, there are many bike parking slots across the country. The Netherlands has over 32,000 km of cycling paths. Whether you are looking for flat landscapes and short distances; or you are looking for a more challenging terrain, there are numerous cycling routes to be enjoyed across The Netherlands including in places such as Amsterdam, Rotterdam, The Hague, Utrecht, ZaanseSchans and Groningen. Both seasoned and beginner cyclists will enjoy cycling in Netherlands. Cycling paths have numerous markers and signs to make it easy for people new to Netherlands to find their way around. When travelling to Netherlands, you could choose to tour the various locations on your bike. There are various places you can rent a bike. Usually, renting is affordable and it will save you the hassle of bringing your bike along. There are various types of bikes you can rent including mountain bike and cruiser bikes. Bicycle renting companies offer different renting schemes to suit the various needs of their customers. Do you know you can save some cash if you book a flight and hotel package to The Netherlands? Bikes are seen everywhere in Amsterdam and The Netherlands. You can rent a bike in Netherlands for as long as you want or need to. Some people rent for a couple of hours, days, weeks and others several weeks. Normally, the longer you rent a bike the cheaper the hourly rates. You can book a bike just for yourself or for the whole family. In Amsterdam you can rent a bike in various places including tourist sites, rental shops, at train stations and in bike shops. Some accommodation locations also offer bikes for renting. You will be required to present your identification documents and pay a deposit when renting. In most cases, the rental fee includes bike insurance in case the bike gets lost or damaged. When travelling to Amsterdam during peak tourist season or during busy holidays, it is recommended that you book your bike in advance. Bike theft is a common challenge for bikers both locals and tourists in Netherlands. Thousands of bikes are stolen annually across Netherlands. Therefore, it is crucial to take precaution measures to prevent your bike from being stolen. Whether going for a meal at a local diner or to the washroom ensure the bike is locked. Bike renters offer at least one bike lock as a standard. Others offer two locks. For optimal security use two certified locks and ensure that your bike is insured. It's easy to rent a bike in the Netherlands. 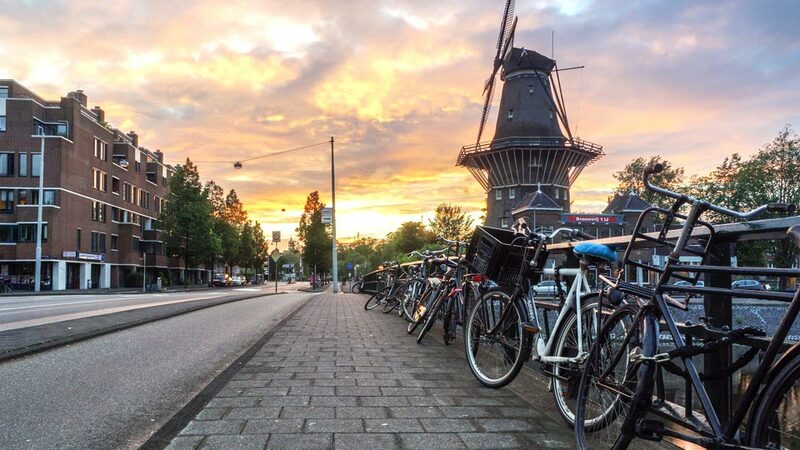 While some bike renters only have the standard Dutch bike, others have a wide variety of bikes including mountain bikes, daily cargo bikes, electric bikes, touring bikes, stepbikes, tricycles, racing bikes, hybrid bikes, tandems and cruise bikes. The different types come in different sizes for children, men and women. Renters also avail bike accessories and basic bike repair kits that you can hire. Alternatively, you can buy the accessories from a bike shop at a few euros. The cost of renting a bike in Netherlands will depend on a number of factors. These factors include the type of bike, whether or not the bike is insured, whether or not a bike has accessories, the length of time that you will hire the bike and the season of the year. Insured bikes are costlier than uninsured bikes. Also, bikes are more expensive to hire on holidays and peak tourist seasons due to the high demand. Rental rates range from hourly, daily, weekly to monthly rates. On average, the cost of hiring the best mountain bikes under 1000 and best cruiser bikes is 7 Euros per hour for uninsured bikes. 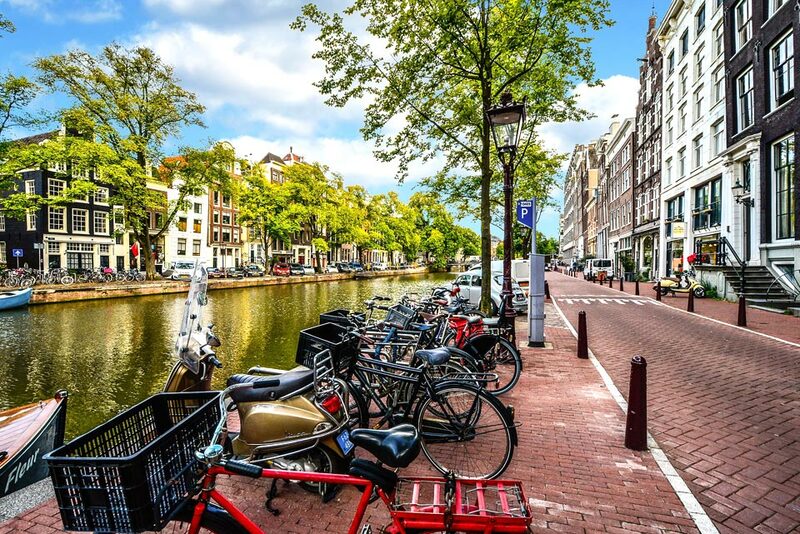 The average daily rate of renting bikes in Amsterdam is 10 Euros to 40 Euros. Weekly rates range from 50 Euros to 100 Euros. 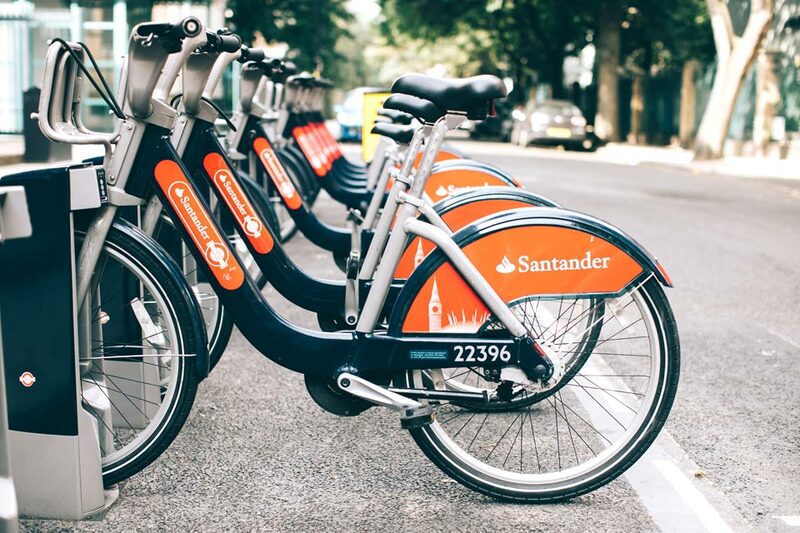 Different bike rental companies offer a price list for different types of bikes, duration of hire, insurance and accessories. When you are looking to rent a bike in Netherlands, do a market research of the various bike renters and their rates. Most have their rates listed on the website. While for some you can book a bike online, for others you will need to visit the renter’s premise. 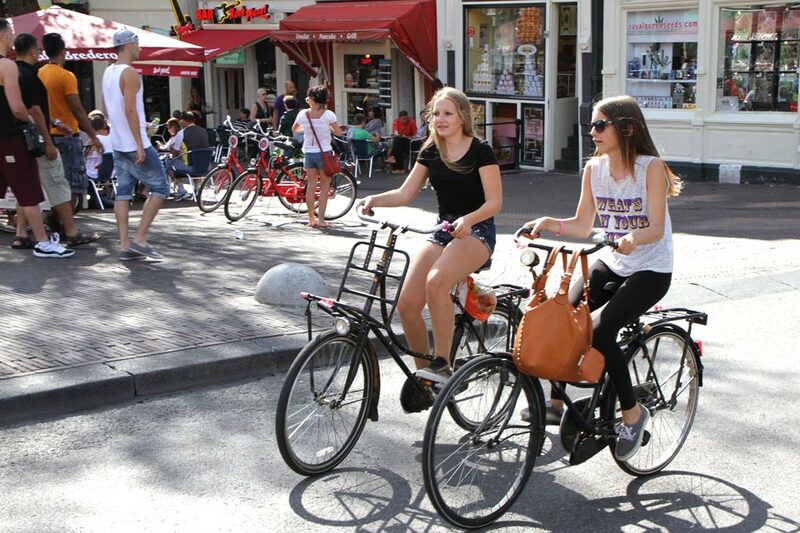 Consider renting a bike at a location that is near your Netherlands accommodation facilities. A typical scene in The Netherlands. Windmills, bikes and canals. There are three main types of biking routes in Netherlands. These include junction routes, themed routes and long distance cycling routes. Netherlands is covered by a network of junction routes. At every junction, there is an information board that contains a map showing the direction and distance to the next junction. The route from one junction to another has numerous route signs leading to the next junction. Themed routes are customized routes designed for various cyclists. Most of them cover 30-100km. Such routes may be covered in a day’s trip or in a week’s time. Long distance cycling routes are ideal for cyclists looking to cover over 1000 km. They link together various themed and junction routes. One of the most popular long distance cycling routes in Netherlands is the Ronde Van Nederland which refers to Tour of the Netherlands. This is the most common route in Amsterdam. It is 23.6 miles with a highest elevation at 508ft. The road has a ride type terrain that offers a beautiful view of the Amsterdam countryside. The route is 79.8 miles long with an elevation of 1,495ft. It is a ride type terrain that passes through four provinces including Amsterdam. It offers a scenic view of the rivers, dutch villages, the Gooimeer grassland and the woods in LageVuursche. The route is 69.1 miles long with a 1,758ft elevation. It cuts through the Amsterdamharbor into the Het Kopje before leading to the Amstel River. Usually, the western Amsterdam routes are quite busy, but the beach life route is less congested. This is a short route that covers 29.8 miles with an elevation of 382 ft. It cuts through the Durgerdam into the Marken Island. The 70.6 miles route passes through the Green Hart offering a scenic view of the villages, large fields, small rivers and lakes. It has an elevation of 1024ft. Girls riding bikes in Amsterdam, The Netherlands. Are you looking for a vacation destination or to take a cycling holiday? Netherlands is one of the best destinations for a riding vacation.Although the Dutch riding terrain is generally flat, Netherlands offers one of the best cycling infrastructure across the globe. Cycling is an easy, fun and affordable way to discover the country. You may choose to ride alone, join other riders or go on riding vacation with your family and friends. You can rent a bike in Netherlands for as low as 5 euros an hour depending on the kind of bike. With numerous bike rental services to choose from, you will definitely find the best budget mountain bike that suit your needs and budget. There are numerous biking routes that have sign posts to enable for easy riding. Both beginners and expert cyclists will enjoy riding in Netherlands. It is important to get insurance on your bike as bike theft is rampant. Plan to do some biking in The Netherlands? Then check out these handy accessories. Have you ever rented a bike in The Netherlands? We would love to know about your experience.